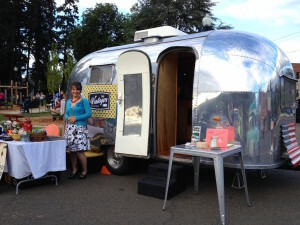 The Vintages’ ’59 Airstream Globester on display at Friday Nights, Dayton’s downtown summer event series. Located on the other side of the Yamhill River from downtown Dayton and accessible via a pedestrian footbridge from downtown, the Vintages Trailer Resort is a community of restored vintage trailers grouped together in their own neighborhood within the 14-acre Willamette Wine Country RV Park. A dog park next door guarantees fun for you and your furry pal. Each trailer offers a unique lodging experience tailored to compliment your wine tasting, dining and exploration. From the terrycloth robes, comfortable mattresses and fine hotel-quality linens to the propane grill and cruiser bikes for loan, the resort offers a getaway in style. 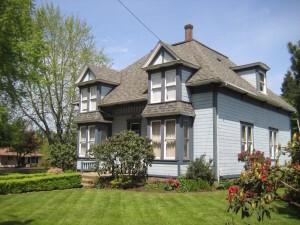 Come relax in a historic 1885 Victorian style home located in the heart of Willamette Valley wine country. This breathtaking property sits directly on the charming town square of Dayton, Oregon, 30 miles from Portland. Perfect for winery exploring! Located in the heart of Dayton, this newly re-decorated home is located eleven minutes from Downtown McMinnville and twelve minutes from Newberg. Either way you slice it, you’re in the Heart of Wine Country. This beautiful home has an open kitchen, wine bar, spacious living room, two full baths and sleeps six; a King size Master Suite and two Queens. Entertain inside or out. The fenced in back yard is your own sanctuary and comes equipped with a BBQ.